Today for Teutonic Tuesday I have a fairly unusual car - a mid-engine gullwing-doored supercar powered by a twin-turbocharged Audi V8. Of course, it’s the Gumpert Apollo. Since there is no 1:55 category of course, this is an entrant in the 1:64 category. Roland Gumpert was the manager of Audi Sport during the 1970s and helped bring the Audi Quattro to life. He later founded his eponymous company in 2004 to produce his own supercar with the help of various engineers, suppliers, and designers. The Gumpert Apollo was produced from 2005 to 2012, and Gumpert filed for bankruptcy in August 2013. Earlier this year, a Chinese group of investors purchased the assets of the company, resurrecting it as Apollo Automobili GmBH, launching a new supercar - the Apollo Arrow. But back to the Gumpert Apollo itself. As mentioned, it is powered by an Audi V8 with two turbochargers, delivering approximately 650 hp and a top speed of 360 km/h (223 mph). 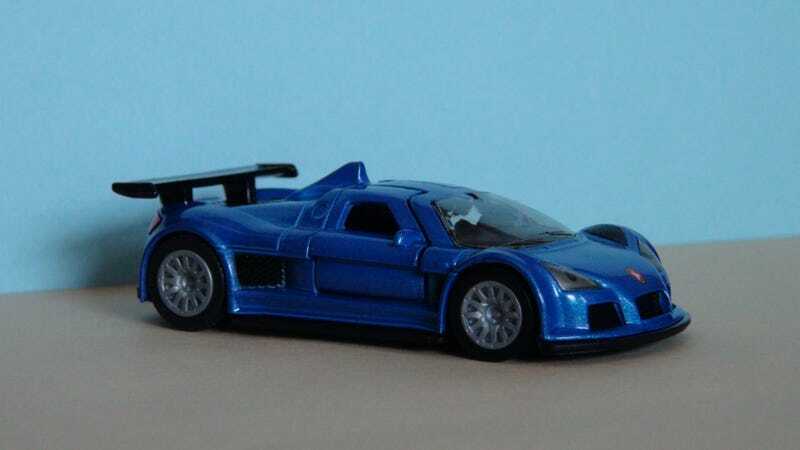 Of course, many know of the Gumpert Apollo because of its feature on Top Gear UK, where The Stig drove it around the Top Gear track, where it topped the Power Lap Board for a while. The cast itself is nicely detailed with opening gullwing doors, vent detailing, and diffusers. This one still has the original packaging, and the included sheet showing most of Siku’s lineup. That’s all for today. Thanks for viewing!